I See by the Papers...: ELECTION 1910: WHY BOTHER TO VOTE? ELECTION 1910: WHY BOTHER TO VOTE? Flip a coin and vote for either the Democratic or Republican candidates; it doesn't matter because they're the same guys. For the second election in a row, the 1910 Santa Rosa election was fixed - the Democrats and Republicans united to offer a "fusion" ticket with the same slate for mayor and city council. The main difference between that year's setup and 1908 was that the earlier candidates were "chosen" by a sham vote at local party conventions; in 1910, the nominees were selected by a committee of political party leaders. There is no good reason why there should be any opposition whatever to the non-partisan ticket suggested by the representatives of the three local political organizations as the result of their recent conference...Some people seem inclined to object to the manner in which "the ticket was nominated." They say a mass meeting should have had a voice in the proceedings and contend that the action of the conference committees savors of "star-chamber" proceedings. But as a matter of fact, no ticket has yet been nominated. All that the conference committees did, after getting together and ascertaining that there was no real difference between the three organizations as to questions of local policy, was to recommend that James R. Edwards be nominated for Mayor, and Messrs. Johnston, Forgett and Pressley be nominated as candidates for councilmen. WAS THE 1910 SANTA ROSA ELECTION ILLEGAL? Santa Rosa voters in 1910 were presented with a single mainstream candidate for mayor and most of the City Council seats, the nominees picked in a secret meeting by the city's political bosses. Was that actually legal? It probably was - technically - although a judge might have thought otherwise, had anyone challenged the doings. It certainly violated the spirit of the recently passed elections law which was intended to make the process more democratic, not less so. "Under the new primary law, conventions and mass meetings are things of the past," Press Democrat editor Ernest Finley explained to voters who were understandably concerned by the doings. Finley was telling a series of half-truths - or maybe he was just unclear about the law himself. California's 1909 Direct Primary Election Law was a confusing mess, the result of a pitched legislative fight that ended up creating a law no one liked. The new primary election law was mainly intended to replace the entire reliance on election-year conventions, where party delegates gathered together to select one nominee from a pool of many candidates - a system that had proven to be easily corrupted by special interests, particularly the powerful Southern Pacific Railroad. The new law allowed every voter to directly choose nominees for his party by ballot. Party conventions were still expected to resolve disputes and settle on candidates when there was no clear primary winner. But direct primary voting quickly proved as corruptible as the convention system. The political machines had inserted a party loyalty clause that made it all but required for candidates to be party flacks. They also found they could swing elections by having tens of thousands of voters under their control switch to a particular party affiliation in order to nominate a weak candidate, as happened in the 1909 San Francisco mayoral race. These and other loopholes were removed when the direct primary law was greatly revised in 1911, which in turn led to the end of the era when the railroads deftly controlled California politics. Santa Rosa's "fusion" ticket, marrying the Democratic and Republican parties together along with the Municipal League was unusual, but not illegal. The law is clear, however, that anyone was able to put their name forward as a nominee in the primary as long as they met partisan requirements, gathered a certain number of signatures and paid a fee, just as today. There is no nonsense in the law about party leaders first "recommending" a bloc of pre-selected nominees to voters. After all, it was called the "Direct Primary Election Law," not the "Rubber Stamp Election Law." But politics can make for strange bedfellows and besides the Democrats and Republicans making the committee's decisions that Finley deemed proper and praiseworthy, the third party at the table was the Municipal League - the very political group that Finley had hammered two years earlier as lying troublemakers with a secret agenda. 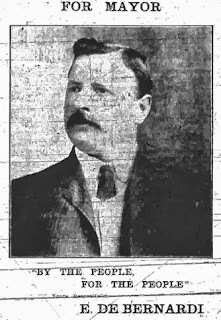 The Municipal League of 1910, however, was not the Municipal League of 1908; the progressive faction that wanted reform - the people who always seemed to make Finley feel most threatened - had mostly split off to form a county chapter of the Lincoln-Roosevelt League that was attempting to elbow its way into the local Republican party. (Much more about that drama later.) Apparently the Municipal League was now mainly the church element that wanted prohibition, which accounts for the "fusion" plank that promised there would be no new saloons and existing liquor laws would be enforced. New hotels and restaurants were exempt, of course, and fat chance on the latter. Although he lacked a proper foe to demonize in this election, Finley did not retire his cudgel. His target now was the man who had the temerity run against the fusion ticket candidate for mayor: Evariste de Bernardi, an Italian immigrant who had operated a hotel and grocery in Petaluma and now owned the Magnolia Hotel in Santa Rosa. Apparently unwilling to openly attack a Santa Rosa businessman, Finley smeared de Bernardi using an editorial page "humor" column from his alter-ego, "Sleepy Bill." Written in thick dialect supposed to imitate an old-timer, Sleepy Bill longed for a return of the good ol' days when Santa Rosa was "wide open" and hoped that he and his sort could elect de Bernardi on the sly. "Bernardi's a cute one, all right, and if youse blokes don't tie no handicap to him, he'll fool de talent and make de trip dead easy." De good peeps ain't fergot as how Bernardi was arrested and fined two or three times fer runnin' a gambling game in his joint after de shake, or how he soaked de price of beer up to a quarter and coffee to a half, and de boys in blue had to call him down. And if I gets it straight, a lot of folks here already knows how he used to run dat hotel in Petalumy. No sir, we don't want to do nothin' that will git any of dem stories started around dis burg just yet. While the dissolute Sleepy Bill hoped de Bernardi was voted into office "afore anybody drops on to what's doin," he still wouldn't knock the fusion candidate for mayor: "Jimmy Edwards ain't fer no dry town...Jimmy Edwards is all right, but he don't trot in my class" ('live the high life like me,' probably). And, in fact, candidate James R. Edwards invited no rebuke. Like the previous mayor, James H. Gray, he was by all counts an honest man untouched by scandal, and unlikely to exploit his position as Santa Rosa's mayor. James Edwards was the assistant cashier at Exchange Bank and after the 1906 earthquake was treasurer of the Earthquake Relief Fund. It was James who drove his father-in-law, Bertrand Rockwell, to a Petaluma bank immediately after the earthquake, where Rockwell cashed a check needed to pay emergency workers. Edwards later became president of the Luther Burbank Company and honorably resigned when the company became mired in disgrace (not of his doing). And as the obl. Believe It Or Not! item for this article, be astonished that he has two graves! One is in the Santa Rosa Memorial Park Cemetery and the other in the Rural Cemetery. James died in 1932 (age 59) and was buried next to his mother at Rural, but his widow, Florence, lived another thirty years - presumably she requested he be disinterred and reburied at her side in the Memorial Park. But the earlier headstone remained behind at Rural. Edwards also shared with his predecessor, Gray - also elected as a "fusion" candidate - a lack of any experience or apparent ambition in politics. Finley and the Chamber of Commerce bunch probably wanted them in office not because they were supposed to act upon the behalf of special interests, but because they could be counted upon to head a laissez-faire administration. Neither mayor stepped up to the plate as a leader, although Gray tried to mediate a dispute early in his tenure and ended up putting the city at risk of a lawsuit as a result. Edwards offered little or no leadership in his two years, even staying on the sidelines during the battle over moving the tannery, which pitted most of the citizenry against the town's largest employer. On election day, Edwards beat de Bernardi 69 to 31 percent, which seems like a huge win until you consider that de Bernardi won a third of the vote with absolutely no support from any political party. The fusion ticket councilmen also all won, although one of them faced a pair of opponents who together received more votes. The anti-fusion votes may have been only a minority dissenting against the town's status-quo polity but it was dissent just the same, and a sign that a sizable number of voters were no longer marching to the beat of the same old political drums. The political pot has begun to boil in Santa Rosa already, and there seems to be a general disposition among the parties to eliminate any contest in the coming municipal election. With that end in view conferences have recently been held between committees representing the fusionists at the last election and the Municipal Leaguers. Certain matters have been tacitly agreed upon, but other matters are yet in the embryonic state. A mayorality [sic] candidate has not yet been found and a nominee to succeed Councilman L. W. Burris has not been chosen. Councilman Burris long since announced tht eh would not under any condition accept the nomination again. In the conferences held, as stated, it has been agreed that the Fusionists shall name the nominee for councilmanic honors from the fourth ward, and it is understood that means the selection of Councilman C. Fred Forgett to succeed himself. The selection of the nominee for the sixth ward has been left entirely to the Municipal Lague, and it is understood that Councilman Robert L. Johnston, the incumbent, is to be his own successor. In the fifth ward, from which Councilman Burris retires, there are two candidates in the open, with a dark horse who may yet take the lead. The men who have been mentioned for councilmen in this ward are Henry A. Hoyt, the contractor, and Leslie A. Jordan, the insurance man. If a choice cannot be made between these men by the committee having the matter in charge, a dark horse is known to be in existence. Representing the parties in the conferences have been seven men, two Republicans, two Democrats and three Municipal League men. Impartiality and non-partisanship, in the appointment of all city officers, in the employment of labor, the purchase of materials, and the letting of contracts. That no bawdy-house district, or public prostitution, shall be permitted to exist within the corporate limits of the city. The regulation of the saloons, and the orderly conduct of of the same; a strict and impartial enforcement of all municipal and state laws with respect to the sale of spiritous, malt, and vinous liquors; the issuance of no new liquor licenses except to bona fide hotels and restaurants, and the reduction of the number of saloons now existing as opportunity will permit, without undue injury to individuals; and in the event of the forfeiture of a license for any cause, no new or other license to be issued in lieu thereof. Much satisfaction is being expressed over the ticket proposed by the conference committee, and there is little question but that it will be heartily endorsed at the polls. Many a time we have fought and struggled through a two-months' campaign, engendering feelings that lasted for years, only to emerge with a set of officers not nearly so well qualified and not half so acceptable generally. James R. Edwards is a man of high character, fine business ability and sterling worth. He can be depended upon to discharge the duties of Mayor faithfully and well. Messrs. Johnston and Forgett have rendered good service on the City Council, and no mistake will be made in electing them for another term. Lawrence Pressley has occupied numerous positions of responsibility and trust, always acquitting himself with credit. As a member of the City Council he will fully substantiate the confidence that has been placed in him. "The several matters covered in the platform speak for themselves, and seem fair enough to suit anybody. This nomination came to me entirely unsolicited, and I am bound to no party, individual or set of individuals. If elected, I shall try to serve the interests of all the people. As far as I am able to learn, affairs in the various departments appear to be running along in a satisfactory condition, and as the object of this election seems to be to avoid any undue disturbance. I see no reason at this time why any changes should be necessary among the city's employees. If I should be elected and later discover that any of the employees of the municipality are not doing their duty or giving the city the proper kind of service, they will have to go, and that is all there is about it. A city, it seems to me, is pretty much like a business concern, and there is no reason why it should not be run along business lines." There is no good reason why there should be any opposition whatever to the non-partisan ticket suggested by the representatives of the three local political organizations as the result of their recent conference. The four men recommended for office are all good representative citizens, who can be depended upon to treat all interests with fairness and impartiality; all are well qualified for the positions they have been asked to fill; there is absoulutely no issue to be fought out; and the best interests of the city demand that the strife and turmoil attending recent municipal elections here be avoided this year if such a thing be possible. Some people seem inclined to object to the manner in which "the ticket was nominated." They say a mass meeting should have had a voice in the proceedings and contend that the action of the conference committees savors of "star-chamber" proceedings. But as a matter of fact, no ticket has yet been nominated. All that the conference committees did, after getting together and ascertaining that there was no real difference between the three organizations as to questions of local policy, was to recommend that James R. Edwards be nominated for Mayor, and Messrs. Johnston, Forgett and Pressley be nominated as candidates for councilmen. The nominations have not yet been made. They are being made now, by petition. Under the new primary law, conventions and mass meetings are things of the past. And the members of the three committees named to confer regarding the best way to go about handing the election under the new and untried law were all duly accredited representatives of the political organizations for which they acted, and their acts were not only authorized by the central or executive committees of those organizations, but also duly ratified before being made public. In addition to the facts above set forth, the action of the conference committees has resulted in saving the city the expense of holding a primary election. Less than a couple of hundred electors were registered in time to qualify themselves to vote at the primaries, and the expenses of holding the primary would have been between $1,200 and $1,500. Taking everything into consideration, it is difficult to understand how any citizen having the welfare of the community at heart can conscientiously oppose the plan that has been suggested for getting rid of the usual election squabble here this year. Having been requested by a number of prominent business men and citizens of Santa Rosa to become a candidate for Mayor in the next election to be held in our city on the 5th day of April, I come before you after due consideration and ask your support. I must say that I come before you with free hands, pledged to no machine nor party, making you no promises, nor trying to mislead you. I do not want you to criticize what I am going to do, but what I have done. My platform will have no planks (especially if rough lumber one may get slivers), no flourishing words, but only three phrases; honesty of purpose, justice to all, and favor to none. I want your support and the support of those that love liberty; liberty of thoughts and action, and if by the past you may judge the future, then I have nothing to fear, fully believing that you will entrust to me the care of your city. I have lived among you for nearly a decade, and having been in business all this time, you have had a chance to see more or less of me and judge if I am not worthy of your confidence, and if next April, the 5th you will choose to cast your ballot for me. I will give an administration that you shall have just reason to be proud of. Mr. DeBernardi does not come before the public as the nominee of any organization, political or otherwise, but merely as a citizen willing to occupy this high place and take over the direction of public affairs here if the people so desire. In launching his candidacy he proceeds under the general law, which provides that any citizen may become a candidate for office upon presenting a petition duly signed by at least three percent of the voters. Mr. DeBernardi was out yesterday securing signatures to his petition, and met with good success. He hopes to file his petition today. Mr. DeBernardi has been a resident of this city for several years, and lived in Petaluma for some time before coming here. He is a native of Italy, where he was born 46 years ago. He was naturalized in 1885, in Marin county. "Say, what are youse guys a-tryin' to do, start something?" said Sleepy Bill yesterday, as he strolled into a down-town resort and began to shake hands all 'round after his long absence. "Can't youse mutts see dat a scrap now is a-goin' to spoil de game and beat de big bloke for Mayor?" he continued. "Our play is fer to lay low, and shoot Bernardi in afore anybody drops on to what's doin.'" "Why, if de choich gang ever gets wise to our man we won't have no more show dan Jim Ramage has of winnin' out in de big race meet wid his one-lunger. Say, dey'd make us look like Joe Tarzyn after a game of pool at de Elk's Club. De good peeps ain't fergot as how Bernardi was arrested and fined two or three times fer runnin' a gambling game in his joint after de shake, or how he soaked de price of beer up to a quarter and coffee to a half, and de boys in blue had to call him down. And if I gets it straight, a lot of folks here already knows how he used to run dat hotel in Petalumy. No sir, we don't want to do nothin' that will git any of dem stories started around dis burg just yet. "Naw; de Police Chief aint settled on yet. De big one wants to give it to Curley Murphy, but we has promised it to t'ree or four, and I don't know just how it is a-goin' to come out. Yes, when it comes to promisin' dats our strong suit, but if you know who you're a talkin' to you don't take any chances. We promised the good gang dat we wouldn't stand fer no red lights and den we turned 'round and throwed de gaff into de udder gang and told 'em if dey wanted t'ings put back de way dey was before, dey would have to come across wid de goods. And dey come, you bet. Oh, when it comes to doin' slick politics, DeB is right dere wid bells, and don't youse fergit it. Pop Collins learned him de game down in Petalumy. "Jimmy Edwards ain't fer no dry town; he says everything is a-runnin' along all right now. But what we wants is to t'row 'er wide open, wake up dese chicken-farmers and make 'em circulate dere egg money. "'You bet, I'd sure a-showed 'em some real speed,' says Dock. The election passed off quietly, as such things go, although during the day much interest was manifested regarding the probable outcome. Edwards' supporters were out early with teams and carriages, and Bernardi had an automobile at work, supplementing this later in the day with a carriage or two. Several of the other candidates also had carriages out. The voting began early, and the total vote cast was 1427. With one or two exceptions, the election officers were those already announced in these columns. As usual, the Press Democrat office was the principal scene of activity in the evening when the returns began to come in. The crowd began to gather before seven o'clock. As the messengers came in from the polling places with the return of votes, the results were quickly totalled up and announced, thus keeping the crowd posted as to the progress of the count. All the returns were in shortly after eight o'clock, with the exception of those from the Fifth precinct, where the count was slow. The fact that there were three men running for Councilmen in this ward may have accounted for the delay there to some extent. 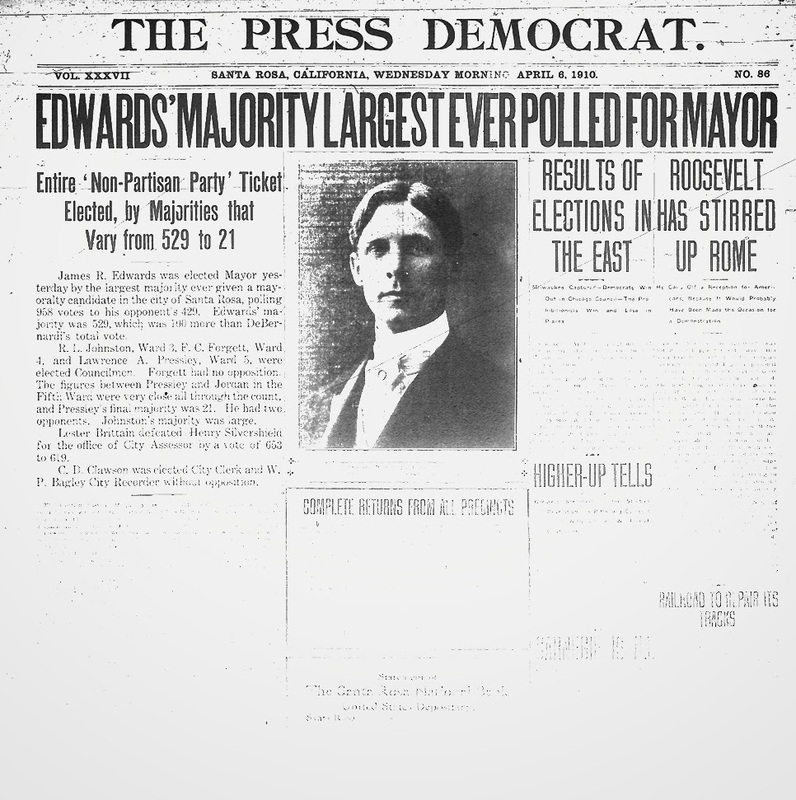 Shortly after nine o'clock all the votes were in and as soon as the result was formally announced a procession was formed and headed for the Edwards' residence on Mendocino Avenue to congratulate Mr. Edwards on his election. Arriving there, Mr. Edwards was called out, and from the porch introduced by Ernest L. Finley as "the next Mayor of the City of Santa Rosa." Mr. Edwards' appearance was greeted with much enthusiasm, and after the cheering had subsided the crowd called upon him for a speech. Mr. Edwards responded with a few well-chosen remarks in which he thanked the citizens for the honor conferred upon him, and pledged himself to do all in his power to promote the welfare and advancement of Santa Rosa. He concluded by inviting all present to come in and have "something to eat and drink." The invitation was accepted with three rousing cheers and the entire gathering trooped inside where Mrs. Edwards and a number of her lady friends served coffee, sandwiches, etc., everybody shaking hands with the new Mayor as they entered the door. After felicitating the new Mayor personally upon his his election and partaking of his hospitality, the crowd departed and later on in the evening, when the meeting of the City Council had adjourned, Mayor James H. Gray and the city officials also called at the Edwards residence and congratulated Mr. Edwards upon his election. The latter party remained about an hour. 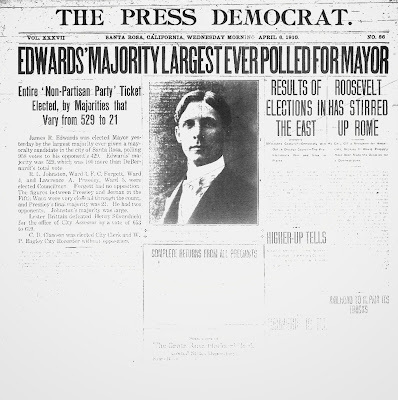 About half-past nine o'clock, Mrs. DeBernardi, wife of Mr. Edwards opponent, telephoned to the new Mayor congratulating him upon his election and wishing him a successful administration.